Sri Lankan junior swimmers came out to perform at their highest possible peak as the first day of the 5th FINA World Junior Swimming Championships concluded at the Singapore Sports Hub OCBC Aquatic Centre today. Kyle Abeysinghe, the younger sibling of Matthew Abeysinghe started off the performances returning a time of 4:18.80 seconds in the 400m Freestyle improving on his local performance by 21 seconds swum over a year ago in the first event of the competition. Imesh Chathuranga who has been showing promise as a leading future prospect returned a time of 1:01.83 seconds in the 100m Backstroke improving on his entry time while Dineth Jayakody fell slightly short of his entry time to finish with 1:04.50 seconds in the same event. Returning to Singapore from Russia shortly after the World Championships, Kimiko Raheem swam the 100m Backstroke event missed improving on her time achieved at the World Championships in Kazan a fortnight ago returning a time of 1:05.77 seconds to be ranked 33rd among the 58 swimmers in the event. Swimming as independent athletes of FINA marked as SMF (Suspended Member Federation) due to the currently suspended status of the Sri Lanka Aquatic Sports Union on account of incongruent autonomy principles in the local sports law, the four boys returned a relay quartet time of 3:47.67 seconds in the 4x100m Freestyle Relay as the day’s preliminaries came to a close. 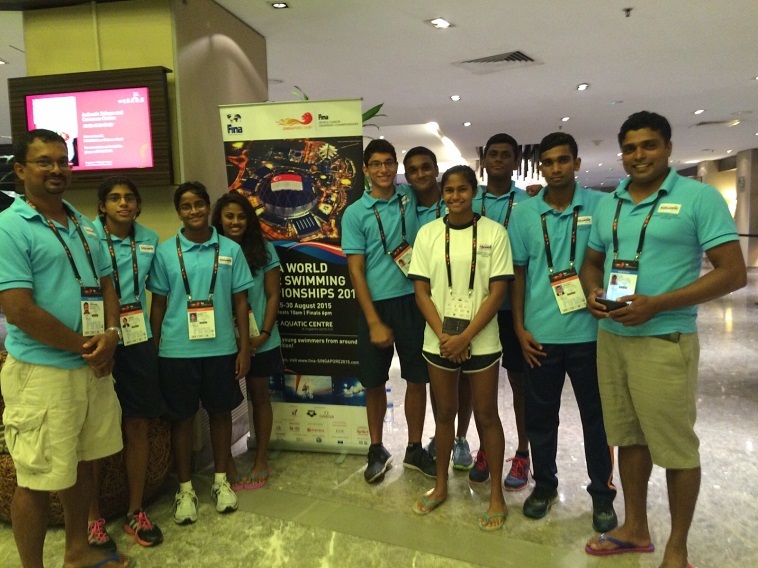 The other swimmers in the team are Akalanka Pieris, Chamodi De Fonseka, Hiruni Perera and Dilrukshi Perera. The team is coordinated by Manoj Abeysinghe (Head Coach), Sineth Akila (Assistant Coach) of the Sri Lanka Aquatic Sports Union team and Marianne Jongsma on behalf of the FINA Scholarship Programme swimmers from the Thanyapura Training Centre in Thailand.